Second Cutest Little Wrench Ever? Didn't want to step on Clippers thread. It's cool, but only raised more questions. Metric? On something from the 1920s? And then there's that "95" left of the logo. Diamond apparently gone for years by 1995, so again, more questions. I was surprised by the arrow (near the hang hole), showing the correct direction to use an adjustable wrench. I've been using an adjustable for 50 years, and never knew. So, any ideas on it's age? Do I have it right (1920s)? Re: Second Cutest Little Wrench Ever? No. Its modern! Early items would have been marked as Diamond Calk Horseshoe Co.
Also it would have been marked as tool steel - not Dimalloy or been shiney/chrome. Early forgings were marked as DULUTH MINN - not USA. I believe they were still in business in 95. The metric markings & direction arrows are both modern, The 95 could just be a die marking. I have a better history of them, just need to find it. Fig. 59. 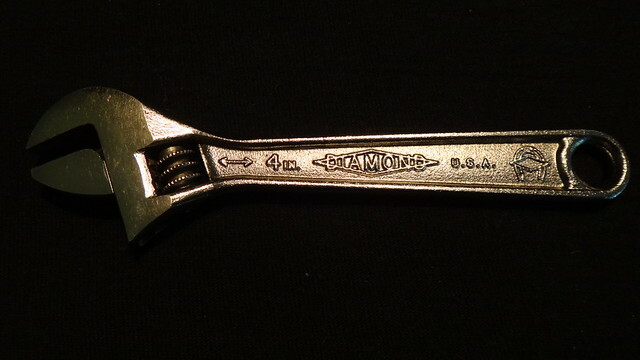 Diamond 10 Inch Wide Opening Adjustable Wrench, ca. 1983+. Fig. 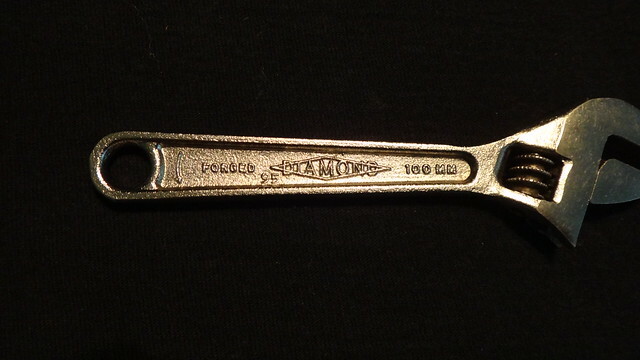 59 shows a later Diamond 10 inch wide opening adjustable wrench, marked with the Diamond logo plus "Wide Opening" and "No Hammering" forged into the shank, with "U.S.A." on the reverse (not shown). The overall length is 10.0 inches. The jaws of this model open up to about 1.3 inches, compared to about 1.1 inches for a standard 10 inch wrench. The maximum head thickness was measured at 0.57 inches. The finish is chrome plating with polished faces. httpAbove is from Alloy Artifacts, just read down a little farther in the Diamond section. So, yours is after 1983. Clearly, I missed that. I thought I saw all the pics there, although I did stay with the 4"ers. Thanks. I'm not sure I'll ever have a need for a 4" adjustable, but I have it. Nice find in your pile of tools. I use a 4 inch off brand adjustable as a caliper for sizing cutting for my fruit tree grafting. I like this one better. Got one like it yesterday. AA says it is from the mid to late 1920's. I carried a 4" adjustable in my pocket for almost 40 years. Had all brands over the years, incl. Craftsman, snap-on, crescent, and some Japanese and Chinese no namers. Nobody yet noted the sub-specialty of collecting 4-inch adjustables. A couple of people have compiled lists that run into the hundreds of variants. One high-dollar 4-incher is the WESTCOTT #74 "s" handle. recently got good money for a 4" Westcott. Our member Mr Chuck as many of the 4" models in his collection. As long as we're talking Diamond--- Being from Minnesota I know people who "collect" the brand as having local interest and beam with pride whenever they find one thinking they so-so very special. Also come across people trying to sell them at premium prices as being something really rare & valuable. Having used and collected tools for a long time it seems to me just about every auction box of tools, tractor tool box, or homeowner tool box has an adjustable wrench. Most likely Diamond or Crescent brand. I'm guessing those 2 brands account for 90% or more of all USA production? I just looked through the Alloy Artifacts info showing all the different markings and such. I have 30-40 4" adjstables and somebody once tried to tell me the one with the horseshoe stamped on both sides is really rare, seems it's just a little older than some? After reading this, it made me go look at the 65 I have managed to accumulate. Surprisingly, not a single Diamond, except in a 4-6 double ender, which doesn’t count. I’ve got more Proto's than any others. I’ll have to pay more attention in the future. I just went and checked my horde of 4 inchers. Proto, Western Giant, Crescent, Utica, Craftsman and Diamond. My Diamond is the same as Stan D's. I own about 15 of the Proto's as they are my favorites. My good friend Brian has a Plomb / Proto 4 inch model hanging on his kitchen wall. I have one Proto 4 incher I used for 13 years and lost it. Many years later I was cleaning out the grease / oil trap in the driveway at my job and found it at the bottom of the pit in good condition because the grease and oil kept it from rusting. I used it until all the little teeth on the thumb wheel were worn away. I worked in a wrecking yard and it was used and abused every day. It still works good and the jaws open up to 15 MM. I could have replaced the thumb wheel, but I retired it instead. I was surprised by the arrow (near the hang hole), showing the correct direction to use an adjustable wrench. I've been using an adjustable for 50 years, and never knew. See, we can all learn something new every day. Turning in that direction will reduce the strain on the adjustable jaw, and keep the wrench useful longer.